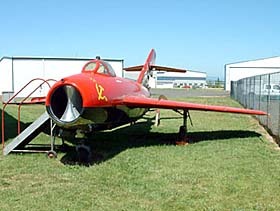 The Oregon Air and Space Museum is dedicated to the acquisition and display of various aircraft and artifacts depicting the history of aviation and space technology for the education and enjoyment of the people of Oregon. a nonprofit, tax-exempt organization and relies entirely on donations, admissions, grants and memberships for support. a popular education tool & a regular part of the curriculum of several area schools. a focus point where pilots, historians, model builders and aviation enthusiasts of all ages share common interests. a frequent sponsor of special aviation events such as fly-ins, dinner speakers, and open house air fairs. Several categories of memberships allow families, individuals and corporations to play a key role in preserving our aviation heritage. In addition, members receive the Museum's newsletter "Wings of Oregon", free admission to the museum, invitations to special events, and access to the museum library and video tape collection. 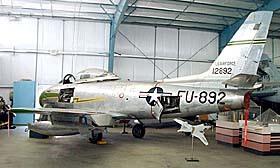 Swept wing single seat jet fighter used in Korea. 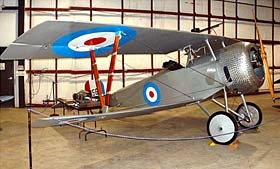 WWI Single seat fighter built by the French, and used by Allied Forces against the Germans. Single seat three-winged WWI fighter as flown by the "Red Baron." Navy carrier based jet bomber flown in Vietnam and the Persian Gulf. Early design of a flying wing ultralight. It weighs less than 200 pounds. Supersonic two seat Navy and Air Force fighter used in Vietnam. Accurate 5/8 scale flying replica of Mitsubishi's legendary WWII fighter. Russian swept wing jet fighter used in Vietnam. Flown by Bill Reesman in "MiG Magic" air show. Three place high wing pusher with complete open "Breezy" cockpit. 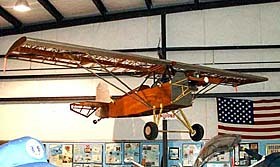 Home built high wing monoplane displayed without fabric covering. Only two of four Douglas World Cruisers finished this incredible trip in 1924. The old Eugene Airport was on their many stops. Over 600 models in constant 1/72 scale built by one person. The model exhibit shows the development of aviation from the Wright Brothers to the Stealth fighter. Includes Hotchkiss and Lewis machine guns; .30 and .50 caliber Browning machine guns; and twin 1917 Spandau machine guns used by German pilots in WWI, such as Manfred von Richthofen... the "Red Baron." Gift Shop and Many additional artifacts and displays. Located at the South end of Eugene Airport. One block north of Airport Road on Boeing Drive.